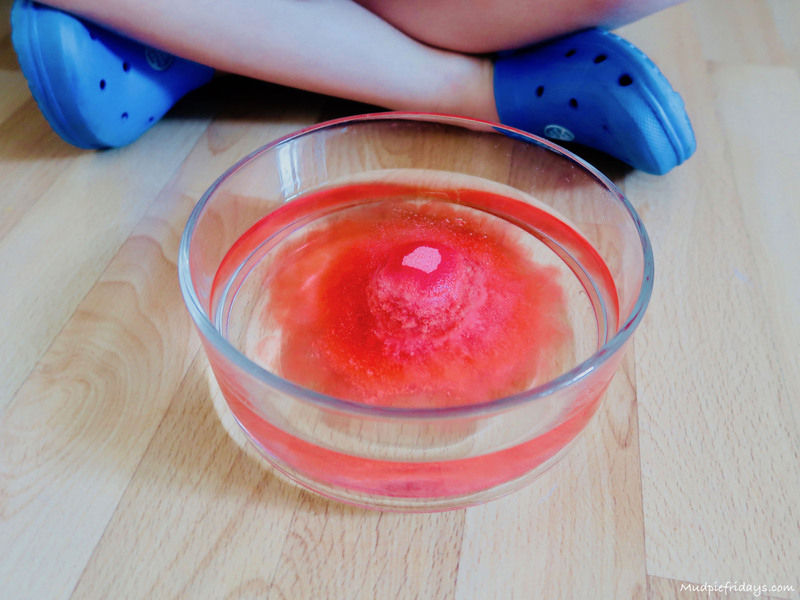 Learning Resources Beaker Creatures Review: If you are regular readers of Mudpie Fridays then you will know we are huge fans of Learning Resources. 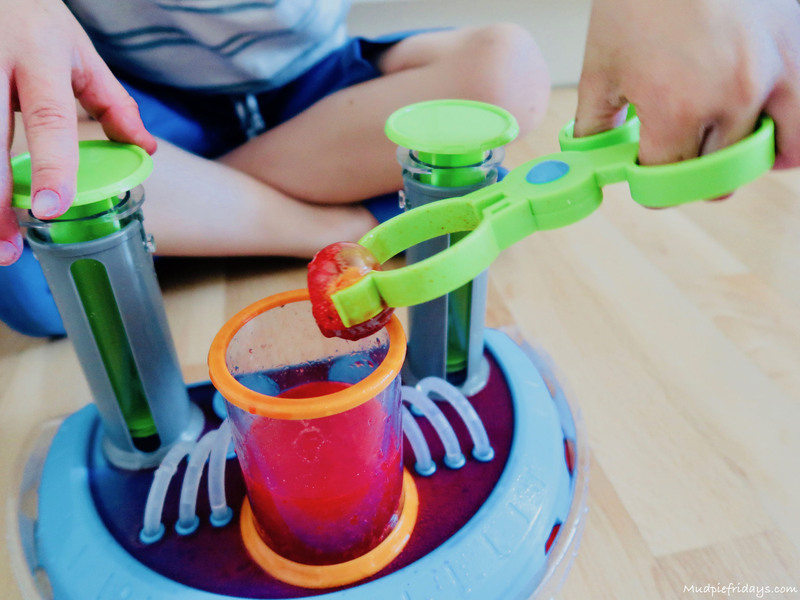 I am certain I have a proper little scientist on my hands. 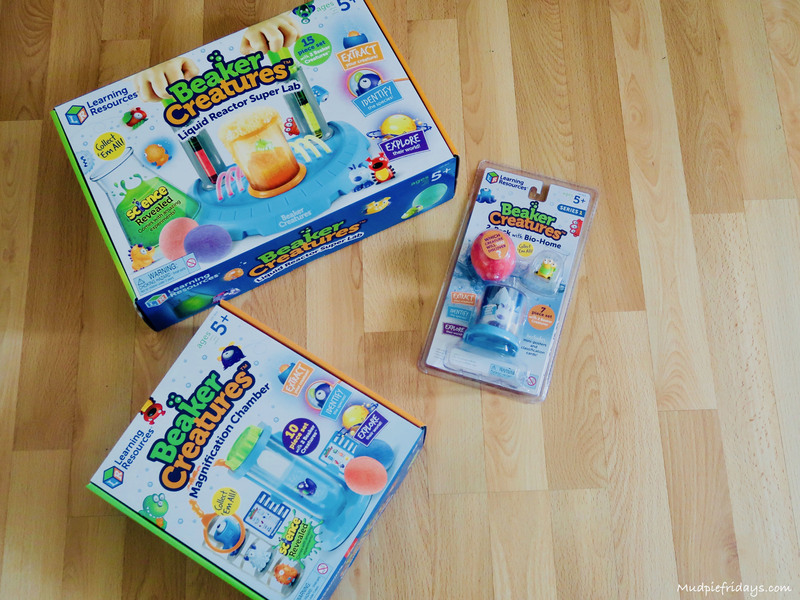 So when they contacted me and asked if we would like to try out their new range – Beaker Creatures. I of course said yes. 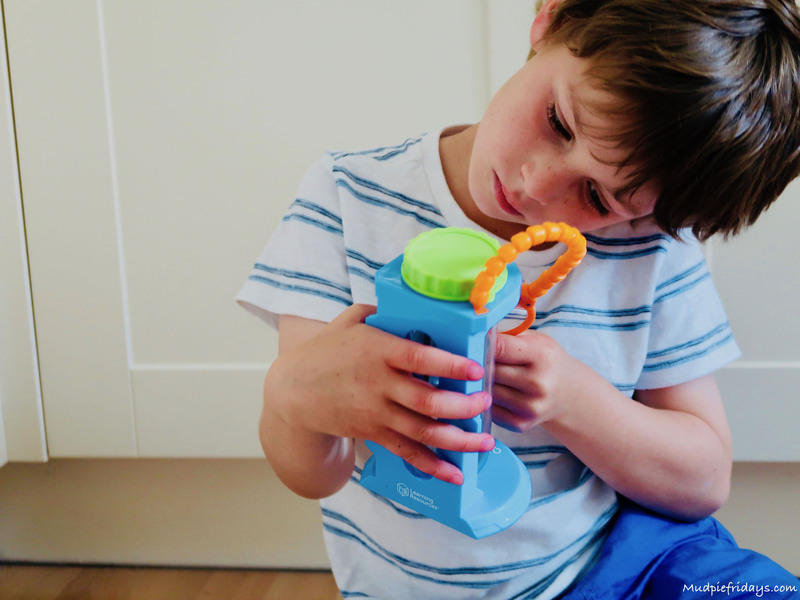 Monkey loves collectables, loves things that fizz and loves anything to do with science and experiments. I thought these would be right up his street and I wasn’t wrong. 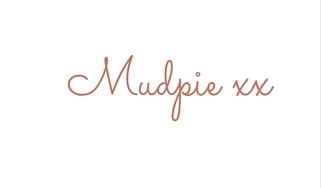 Read on to find out how we got on with them. We were sent three different toys from the range. 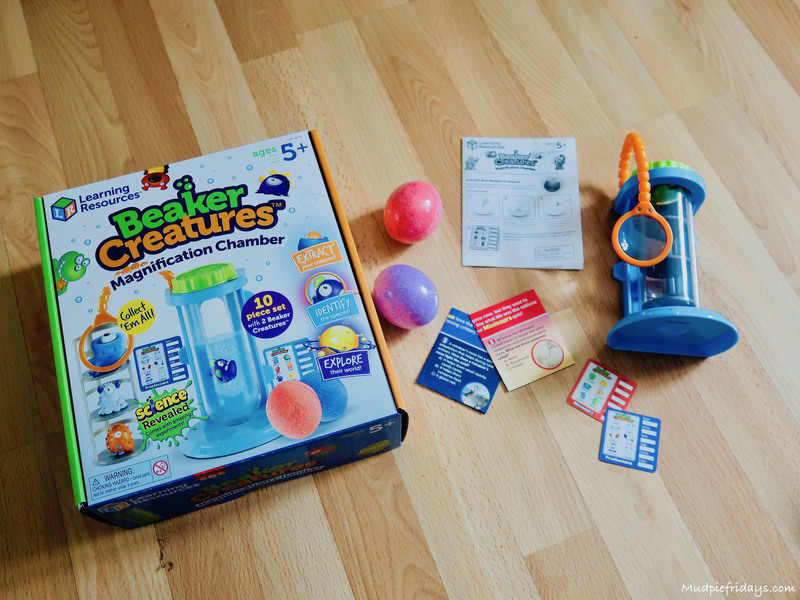 These were Beaker Creatures™ 2-Pack with Bio -Home, Beaker Creatures™ Magnification Chamber and Beaker Creatures™ Liquid Reactor Super Lab. We started with the 2-Pack Bio Home. Monkey was very excited and couldn’t wait to put the reactor pod in the water. 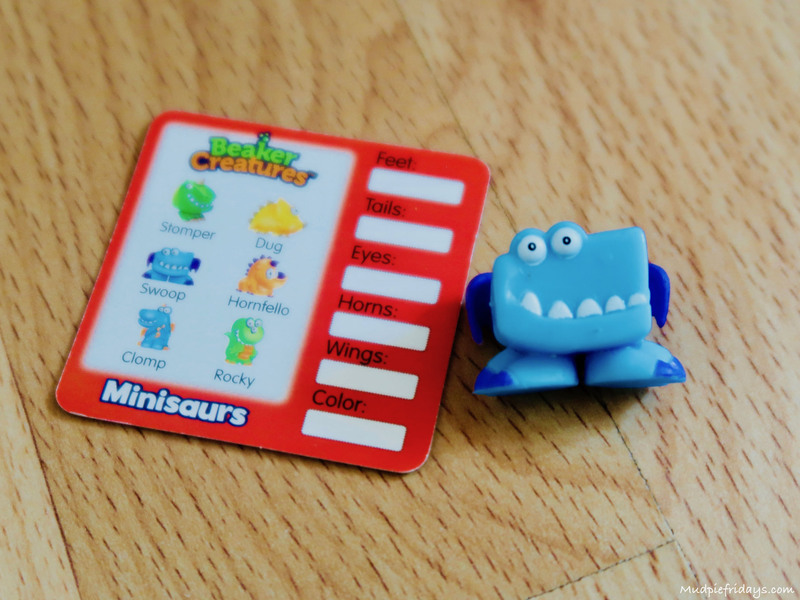 In the set you get two classification cards, two double-sided mini-posters featuring amazing science facts and fun images, a beaker creature reactor pod, a bonus beaker creature and a plastic bio-home. I felt this was a lot for £10. When you put the reactor pod in the water it fizzes away. Leaving behind a small plastic pod with a creature in it. As our reactor pod was red we already knew that we would have a creature from Minisaurs planet. Turns out Monkey got Swoop. His other beaker creature came from the Buglettes planet and was Gnate. 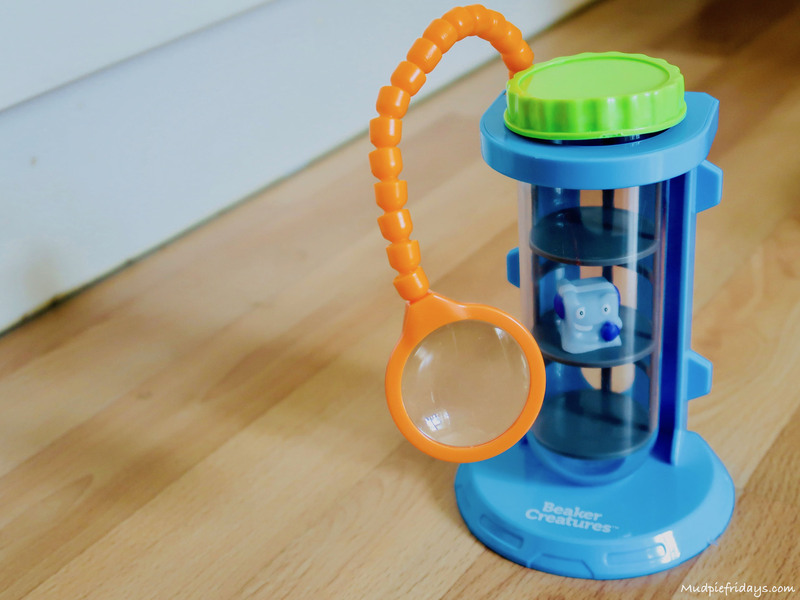 The bio home has a built in magnifier on the top so that you can take a closer look at your little creature. Plus there is a care which can slot into the back of the home. It has a picture of the creatures likely environment. The bio-home is the ideal place to display Monkey’s collection. We then moved onto the Magnification Chamber which came with two Beaker Creature reactor pods. 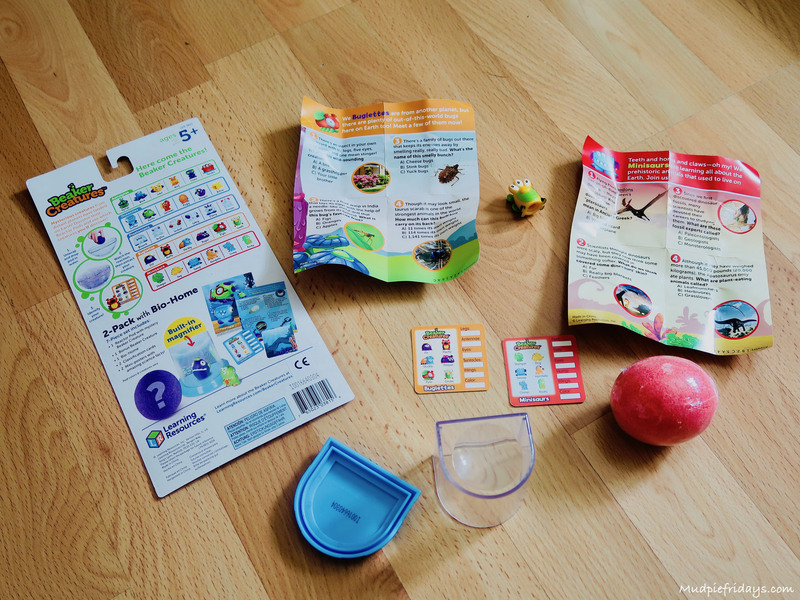 Also included in the ten piece set is a 3-piece plastic magnification chamber, two classification cards, two double-sided Mini-posters and an experimentation guide featuring step-by-step instructions for three experiments. This time we had a purple reactor pod as well which meant the creature inside was from the Frostonians planet. 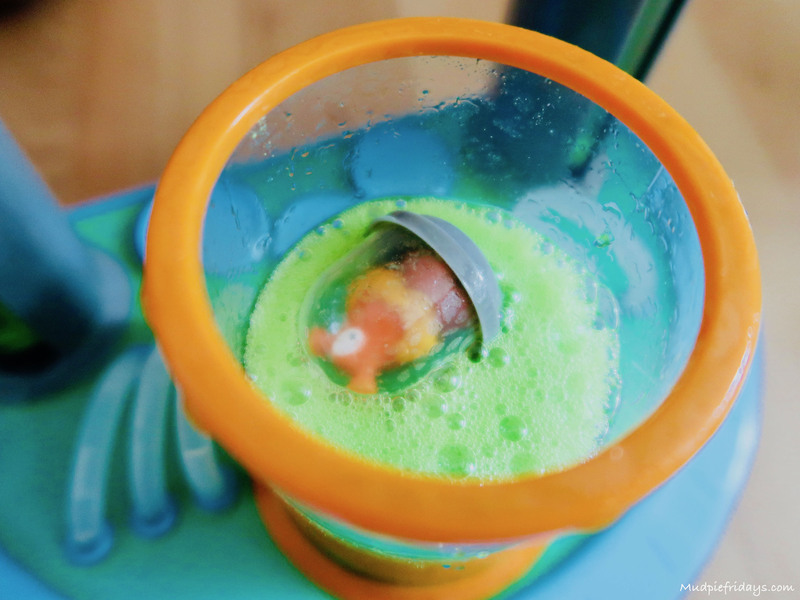 Again Monkey put the pod into a bowl of water and watched it react. Although he couldn’t help put stick his hands in to help it along! 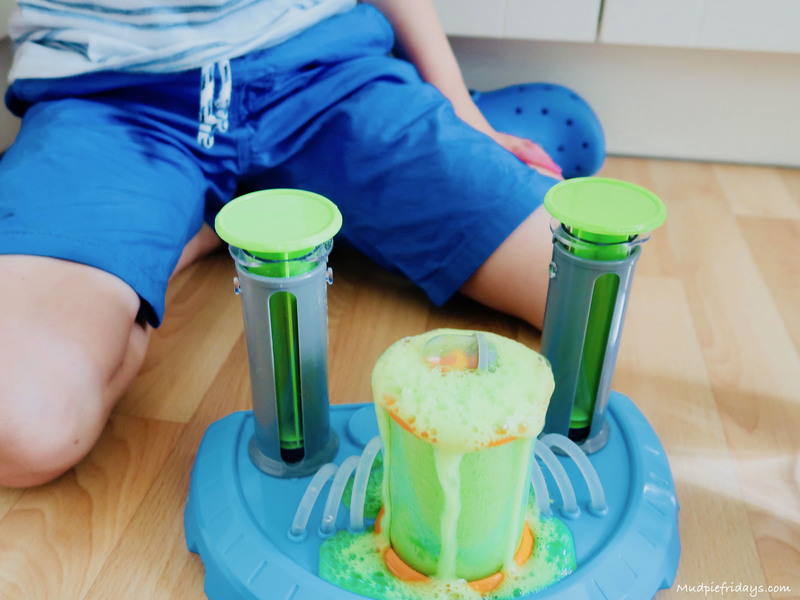 The third item we were sent was the Beaker Creatures Liquid Reactor Super Lab. This was without doubt Monkey’s favourite out of all of them. I think this is because of the way that the reactor pod is put into the water. Unlike the other sets where we have used our own bowl. With this one you fill two giant syringes up with water and then plunge them at the same time. This then fills the beaker and starts the reaction process. 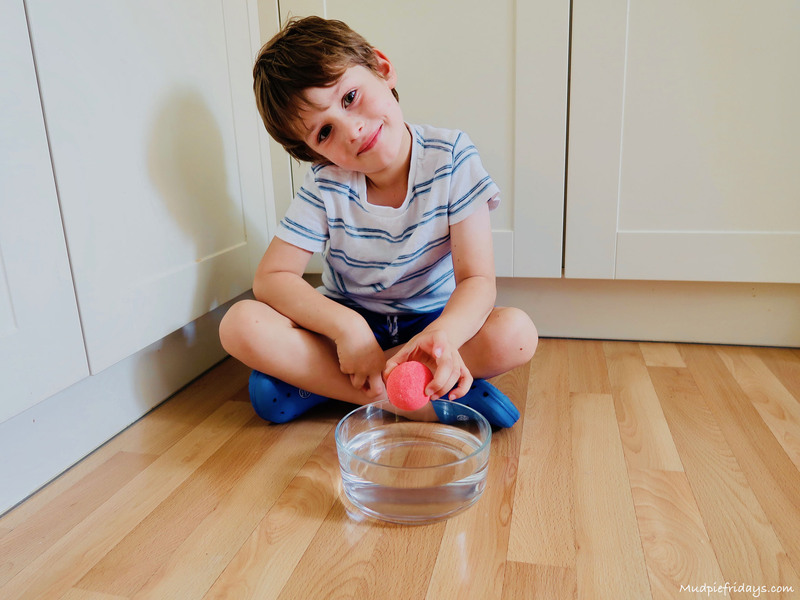 Monkey very carefully set the plungers up with water once I had completed construction. Before adding the reactor pod and fishing out his collectable. 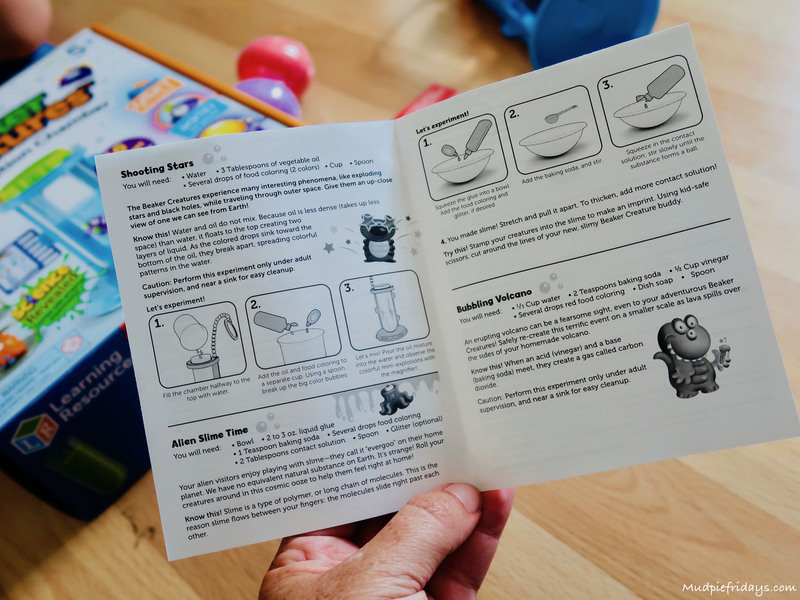 You can download the experimentation guides from the website incase yours gets a bit messy while the kids are having fun. Its a really nice way to expand the set. 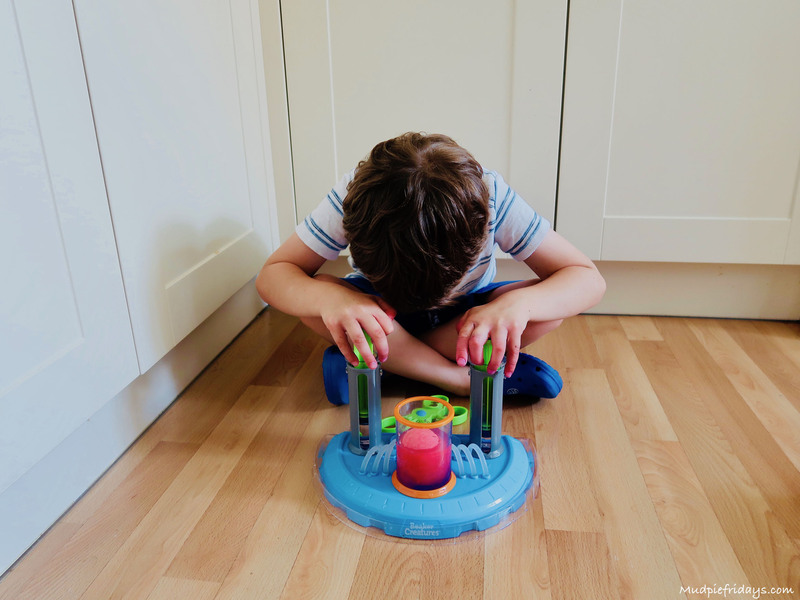 We had great fun playing with all three sets. Although Monkey’s favourite was by far the last one. He had already asked if we can buy some more pods, which we will be doing. Along with trying out some of the different experiments which the guides suggest. Prices range between £10 an £25, aimed at 3+ the sets can be brought online through Learning Resources website. 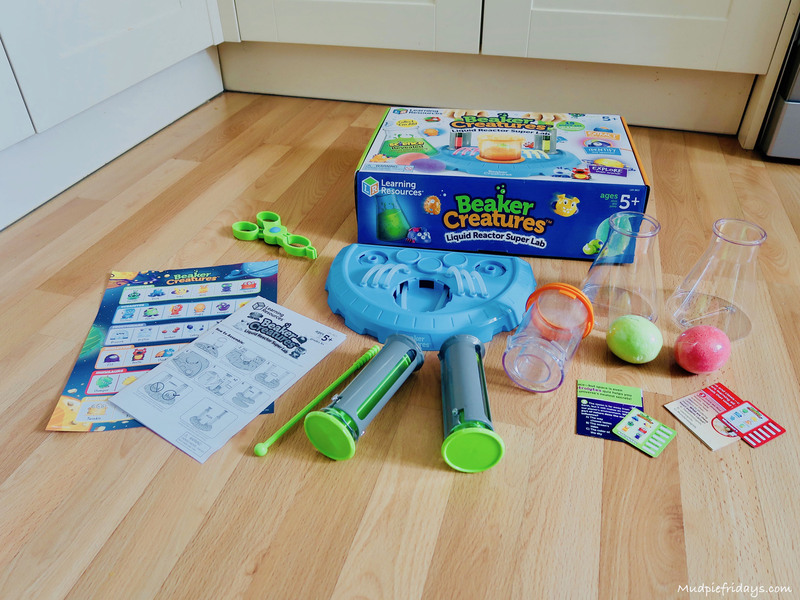 The lovely people at Learning Resources have offered my readers the chance to win a Beaker Creatures set worth £50 for themselves. To enter please use the Gleam application below and please note the T&Cs. 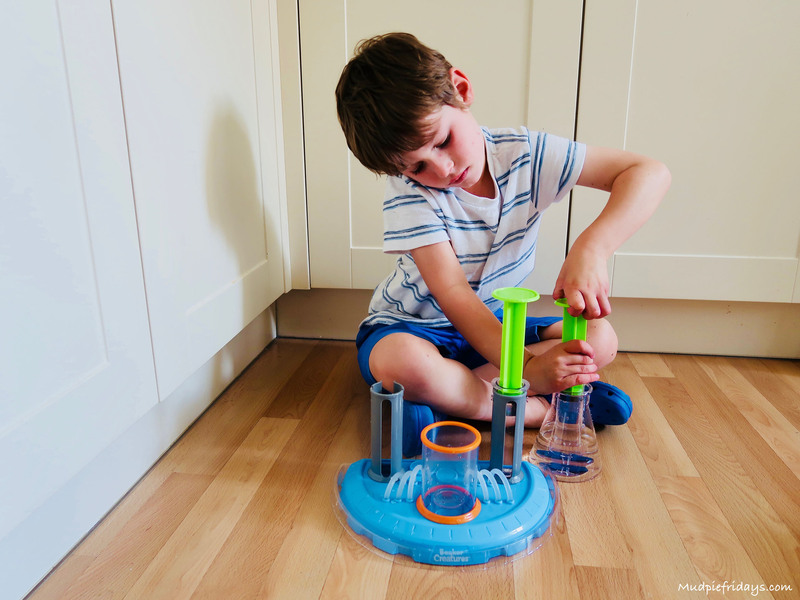 One winner will be drawn at random and will receive their own Beaker Creatures set which includes a Beaker Creatures™ 2-Pack with Bio -Home, Beaker Creatures™ Magnification Chamber and Beaker Creatures™ Liquid Reactor Super Lab combined worth £50. 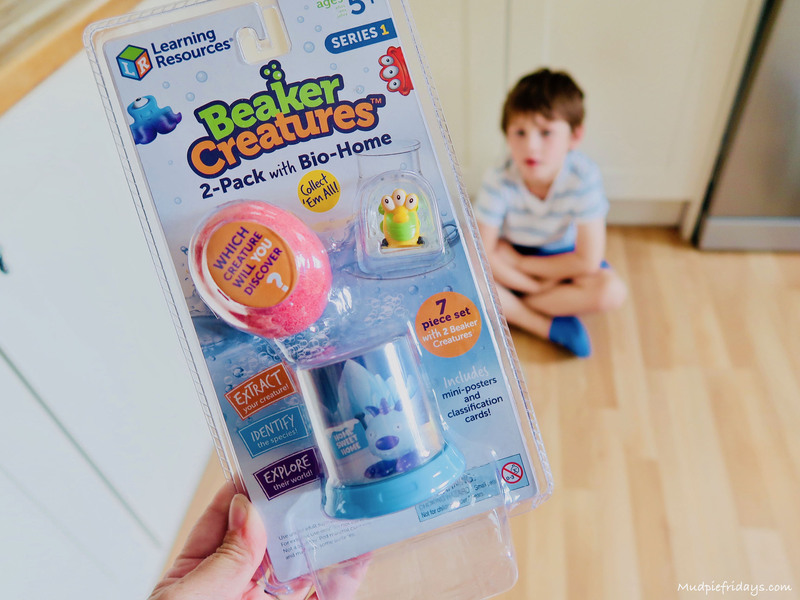 We were given a Beaker Creatures™ 2-Pack with Bio -Home, Beaker Creatures™ Magnification Chamber and Beaker Creatures™ Liquid Reactor Super Lab for the purpose of this review as every all words and opinions are my own. This looks like a lot of fun and educational too. These do look fun! As well as a future engineer (re. rock/sand castles) you also seem to have a scientist in the making. I think my grandaughter would get a lot of fun out of these. THis would be great for my nefew s christmas gift, did I just say christmas ? These are so great, my son has wanted them since before they even came out in this country. Hopefully I can win this for him, but will definitely end up buying them if not. Thanks for the chance! This looks a great introduction to science for my grandchildren! I imagine my son would love this! My nephew would go nuts for this. My nephews would love this prize. What a fun way to learn. Looks like great fun ? What a great prize, my grandson would love this! I’ve been waiting for a discount on these and just when I thought they had gone on sale today, it was a US only say. Doh. I’d love to get them for my son, but can’t really afford them right now. Woudl be so happy to win. Thanks for the chance! I like these because they have to actually engage their brains to play with them. Great giveaway! My daughter would definitely love this. 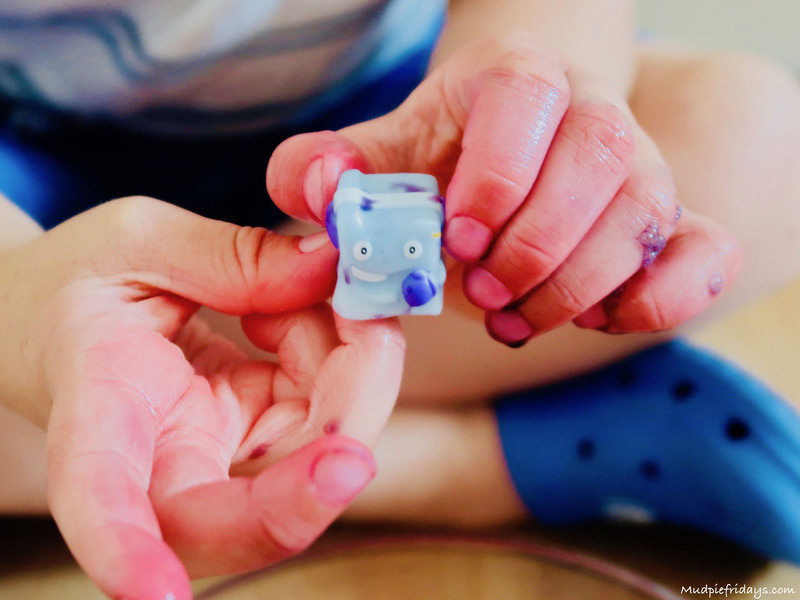 These look so much fun, but educational too! These look great, my son loves his collectibles. My son and I would have so much fun with this! Thanks for the great prize and competition. Liked and Shared. This looks so much fun! My 2 girls would really enjoy this activity. God daughter would have fun with her wee mates with this!